Creepy blood smeared handprints, each the size of a large adult man, approx 10.5-inch (26.25cm) long from wrist to longest fingertip, by 8.25-inch (20.63cm) wide, including assorted blood spatters of various sizes. Two sheets included, for a life size pair of ghoulish handprints! A great Halloween horror decoration that will freak out house guests and passing drivers! Stage your own Dexter inspired, psycho-themed CSI crime scene with these bloody murder victim decal clings on your car or home windows and mirrors. 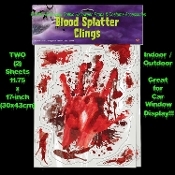 The lifelike red blood smeared handprint surrounded by spatter will disturb even the bravest zombie or vampire hunter! Apply this gory disembodied bloody handprint surrounded by various size blood splashes and spatter to car and house glass windows, storm doors and smooth surfaced appliances to add to the ghoulish ambiance of your next Halloween costume party, morgue scene, mad scientist laboratory, zombie and vampire horror movie premieres, and haunted house decorations! Package includes two sheets of high quality plastic vinyl printed blood splatter stickers decals clings. TWO Identical Sheets, each measures approx. 11.75-inch wide by 17-inch tall (30 x 43cm). Total of 18 pieces of various size blood spatters and smears per package. -No tape or adhesive needed. -Adheres to most non-porous surfaces. -Best adherence if applied at temperatures above 40 degrees F.
1. Clean surface with damp cloth. 2. Apply non-printed side to damp surface. 3. Press and smooth from center of cling.